Certificate Manager is available in Linux only. System storage is used for certificates in Windows and macOS. Master PDF Editor uses digital certificates to encrypt/decrypt PDF documents and sign PDF with digital signature. Linux distributives supported by Master PDF Editor lack unified centralized certificate storage (unlike Windows and macOS, so Master PDF Editor uses own certificate manager for Linux. Network Security Services library is used for Certificate Manager. If you wish, you may organize own access to certificate database without using Master PDF Editor. Certificate DB folder and password are specified in the application settings: Tools->Settings->Certificates. DB password depends on your system, so it is not enough to just copy files to other machine in order to export DB. If you want to move certificate DB, you have to export and import all the certificates to the new DB using Master PDF Editor or own NSS-based utility. This tab specifies your personal certificates used to sign documents, verify signature, encrypt and decrypt files. This icon marks certificates with closed private key. They are used to create digital signature, encrypt and decrypt documents. Other certificates are used only to validate signatures. Import – Add your certificate to the list. Export – Save a certificate from the list in the chosen directory. Delete – Delete certificate from the list. Use caution, certificate cannot be restored after this operation. A list of system certificates by certificate authorities used when verifying digital signatures in PDF documents. 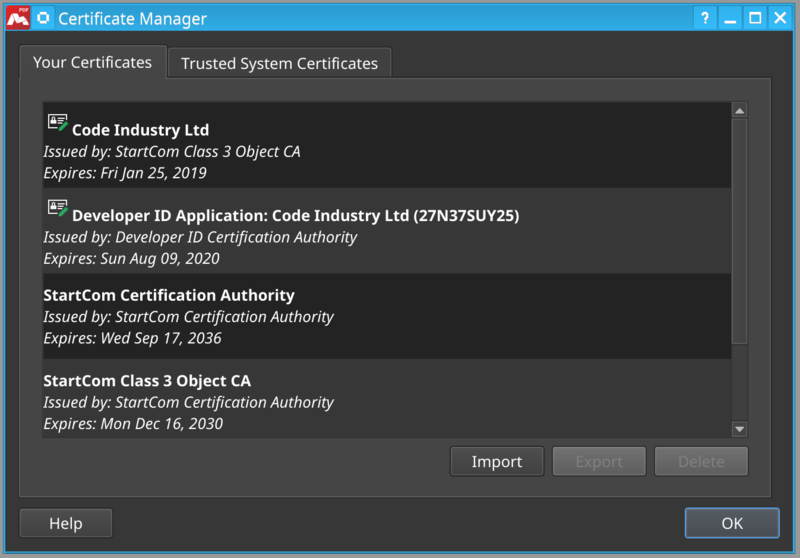 In application settings: Tools -> Settings -> Certificates, or you can specify directories with these certificates for your system. Import mycert.pfx you created to Certificate Manager. Then your certificate will be available for signing your PDF documents.